Hi there traveler! I am so glad you are interested in Iceland, probably, my favorite country in the world! This article will help you tour the Golden Circle like a boss and maybe after reading it, you will consider including Iceland on your bucket list! This is the first of my 4 articles related to road trips in Iceland. 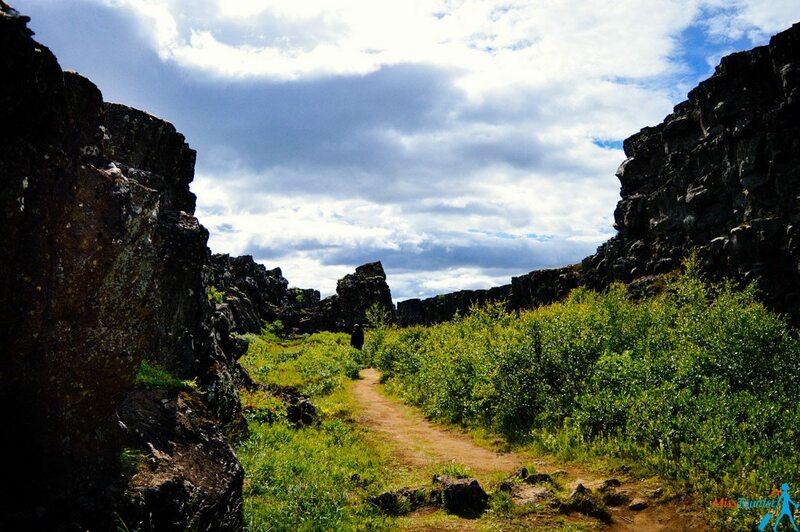 This particular one can be treated as a stand alone 4-day Iceland itinerary self-ride trip for those who decided to spend only a short vacation here. For everyone else, this is the first stage of the travel around Iceland in 14 day guide. So, are you ready for the adventure that might change your entire life? Day 3 – Turf houses and some fantastic waterfalls! First, there are a few things you should take with you. Iceland is expensive and shopping there is a pain in your wallet. Although, they have some really beautiful sweaters (quite expensive). But hats and mittens are just as nice and more affordable. UPDATE! 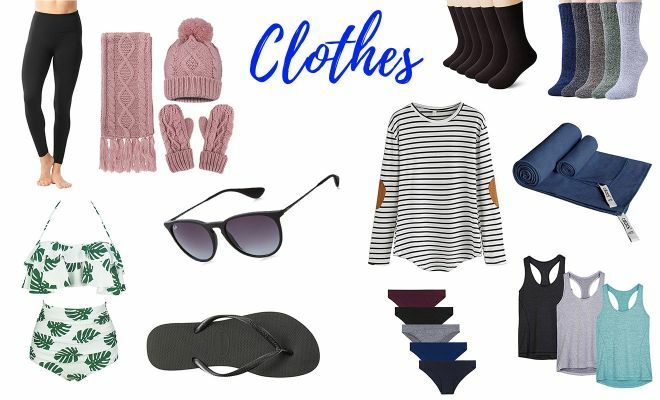 I have written a detailed blog post about things you should bring with you in the trip sorted by season and by gender, check it out here! Swimming suit. 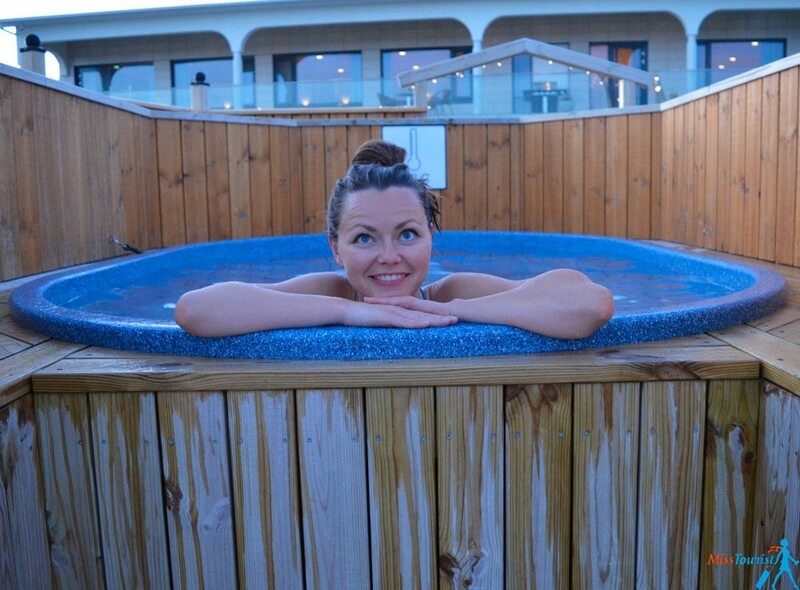 Yes, you are going to swim a lot in thermal waters at every hotel and in the Blue lagoon. Hiking boots – you’ll need a good comfortable pair, and the prices for these in Reykjavik were plain scary. You are going to hike, walk on ice sometimes and get wet near the waterfalls. Get a good pair, especially if you will go all the way with this itinerary. Hiking pants for hiking obviously, but also because they are so comfortable! A fleece jacket – you will wear it the most throughout your trip. A GPS device – check if your car has one – otherwise it will be at least 10-15USD per day if you rent one, this way you can bring your own and use it back home as well. For this part of the trip this is important, as you have many stops that are easy to miss. If you are into photography – a great cameraand a tripod are essential. In the same category – a GoPro is a cool thing to get. 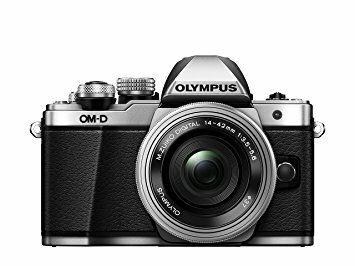 There will be endless opportunities to use that wide angle for spectacular movies and images. A power transformer, if you come from the US, Iceland is hooked to 220V not 110 and this way you can use your electric devices, if you bring any. The first day of your adventure! Are you excited? You should be, because Iceland is a country with very unique landscapes, sights and activities! And you are going to experience a wide variety of them! First thing’s first: the Blue Lagoon! If you arrive in the morning, pick up your car from the airport, not from the city. It will save you quite a lot on public transport which is not cheap at all. Didn’t figure out how to get a car yet? 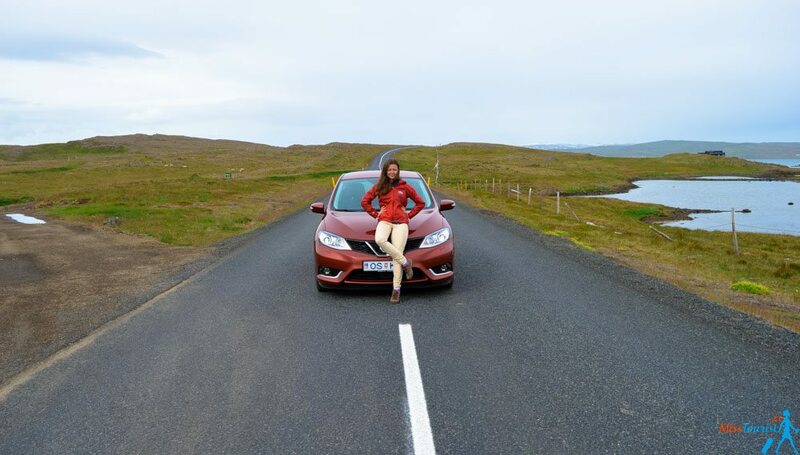 Here is my guide of how to choose the best car rental in Iceland! If you follow my guide, you won’t need a 4WD, a 2WD will suffice. So, you got your car, now head to the Blue Lagoon. It’s at around 20 minutes drive from the airport, but if you flew in late, you can come back the next day (it opens up its doors at 8 (9)a.m. depending on the season). 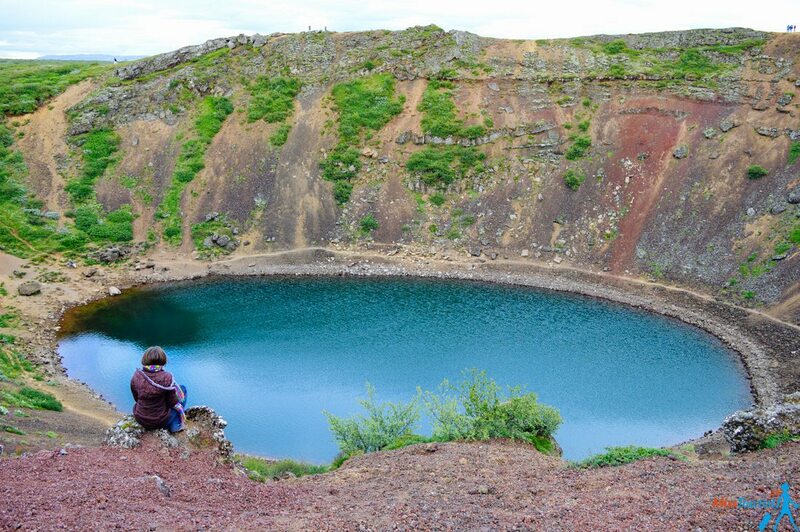 The Blue Lagoon is placed in a lava field (the first one you will see in Iceland). It has pools of thermal waters with a striking blue color (thus the name, obviously). The spa center is very modern, and it offers several packages that you can buy, starting at around 35-40 euros. You can find more details in my post here. When you are done relaxing, you can head back to the city. I have written a more extensive guide of what to do in the city of Reykjavik. If you are in Iceland only for a day or two and you want to take a complete tour of the Golden Circle and the Blue Lagoon, I recommend taking this tour of 11 hours. If you want to go to the Blue Lagoon directly from the airport without renting a car – take this transportation option. The first day is dedicated to the Golden Circle: a more or less 300 km drive which includes a chain of popular Iceland attractions not far away from Reykjavik. People who have a one day stopover usually take this route. If you ONLY have a couple of days in the country, I would definitely choose the Golden circle tour. What is recommended for this day? From Reykjavik start north towards Thingvellir National Park (Þingvellir in Icelandic). That would be your first stop on your “golden circle” day. Historically it is the place of where the old parliament of Iceland was established more than 1000 years ago. Here you can find Iceland’s biggest lake and more impressive, at least for me, in the national park there is a rift valley that marks the place where the North American plate and the Eurasian plate meet! When they meet, they create some spectacular geography! And how many places in the world do you know where you can walk around and touch the border between the two tectonic plates? And not only you can just walk all over it, you can swim between them too! If you started early enough, you have a chance to dive in the rift created by the two plates! And for all you, Game of Thrones fans out there, this is also the place where many scenes of the show have been filmed, so make sure to check out where exactly if you are die-hard fans of the series. Next stop, less than 1 hour away to the West was my favorite of the day, and pretty much one of the coolest things I have seen in my life: the Geysir! Oh my God, I watched it “sneeze” over and over again. It’s just beautiful, powerful, fun and just cool to watch. You have to go see it, it’s so spectacular, I’m still excited about it :)! 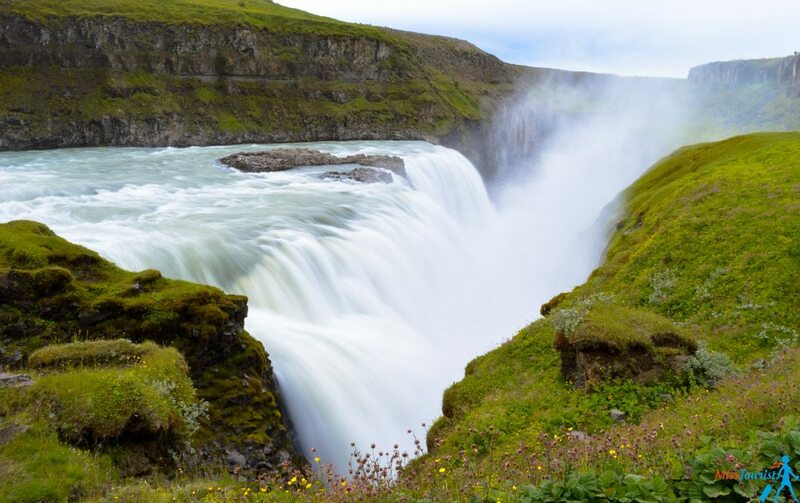 Just a short drive further from the Geyser you can find the Gullfoss waterfall. This one is a beauty, if you go up close you might want to get your waterproof jacket and/or pants, as it will spray you all the way! They say at some point in the early XXth century someone wanted to build a hydroelectric power plant on the fall, but the Icelandic people living here would not sell that right. Thank you Icelandic people, now we can still enjoy this wonder because you love your nature! When coming back from Gullfoss, if you take the 35 road, pay attention on the road for the signs towards Kerið. By this time you should be quite tired. It was a full first day and it’s time to rest. There are a few choices where you can spend the night. The best place for you to spend the night in order to have a good start in the morning is Hella. I stayed at Stracta hotel and I really recommend it! 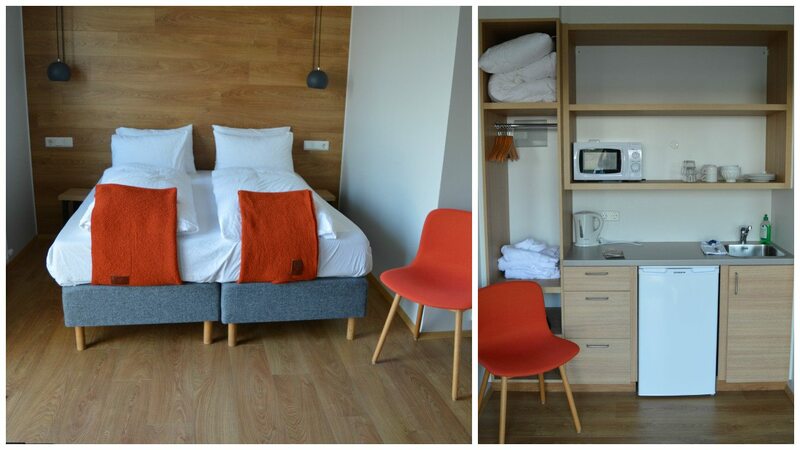 It is a new and very large hotel, with modern and spacious rooms. It is really easy to find, you can just see it when you enter Hella, on the right side as you come from Reykjavik. They, of course, have pools of thermal waters and saunas with very new facilities. Unfortunately, I haven’t caught the Northern lights in Iceland, but I have heard that Stracta hotel is just great for that! If you are feeling hungry, their elegant and delicious restaurant is open in the evening. 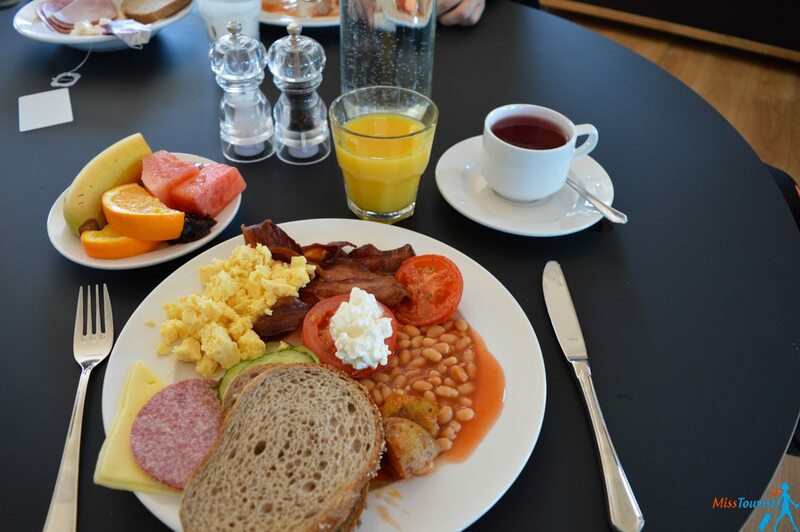 The breakfast is of high standards, rich and varied to give you lots of energy for the long day ahead. Check availability and rates here! 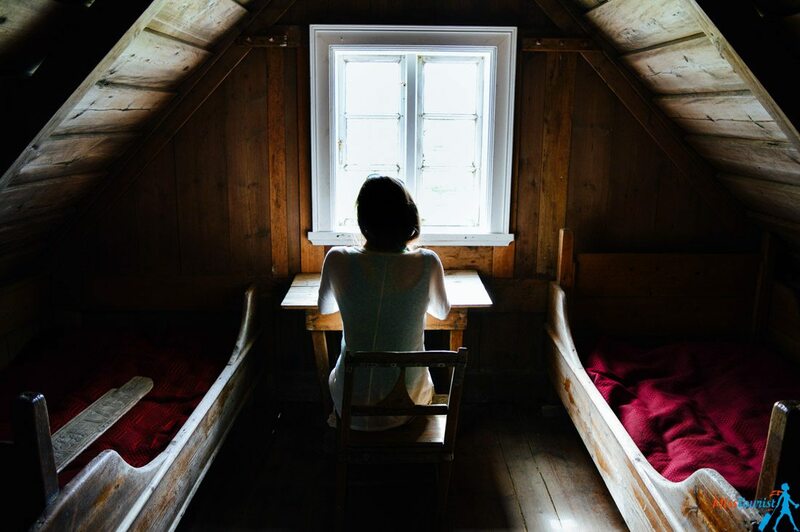 UPDATE: I now also have an article that will help you book ALL hotels in Iceland in under 10 minutes – they are sorted by cities and prices for your convenience and they all have great reviews! You already left behind the first impressions of Iceland, and they were quite powerful. Don’t doubt a second, it will only get more interesting starting from this point of the journey! Start your day heading south-east on the number 1 road. 8 km after Hella, you will see a sign to Kledur. 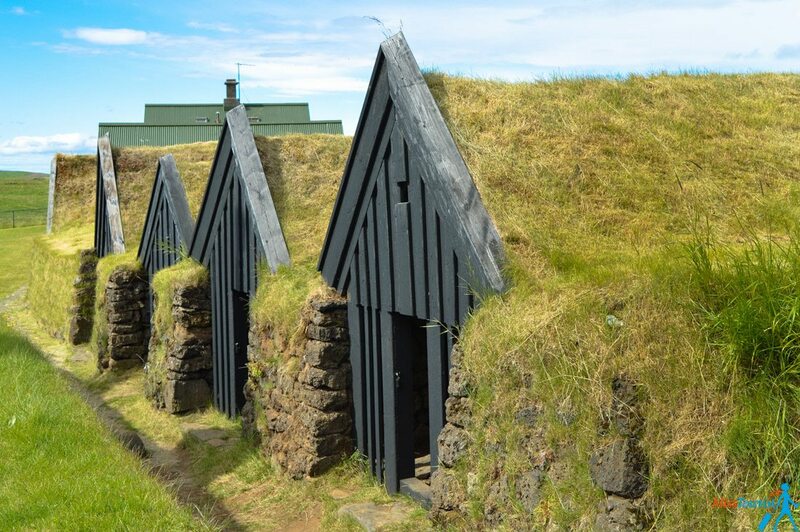 If you want, you can take the road to a small village where turf houses still stand. You can learn about their history and the small community that used to live in that area if you decide to visit them. Come back to the road 1 and continue on it until you get to the Seljalandsfoss waterfall. The waterfall is taken out of a fairy tale, isn’t it? PRO TIP: just 300 – 400 m. more far away, there is another waterfall, this time in a cave. It is called Gljúfrafoss and if you ever imagined how a waterfall in a cave looks like, this is probably close to what you pictured! This was by far my favorite in the whole country, do not miss it! Alright, I know you want to stay more and see it, but I urge you to continue on, just around one hour drive away you will stumble upon another amazing waterfall (this will repeat, yes, Iceland has tons of them!). So bring your waterproof jacket / poncho / garbage bag with you ! PRO TIP: if you get accommodation in the area and decide to stay one more day, you can hike above the waterfall. There is a big plateau over there, with outstanding views. 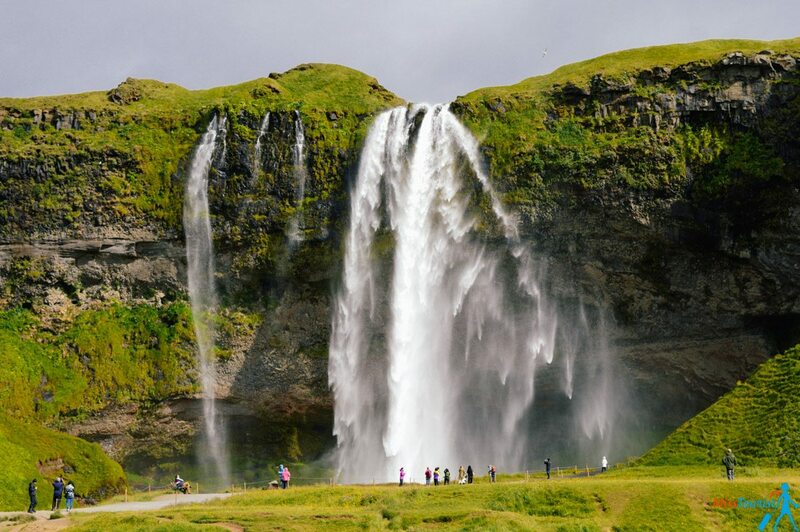 PRO TIP2: for better pictures, when you climb above the waterfall, use the paths around the stairs to place yourself to an even better view to Skogafoss. 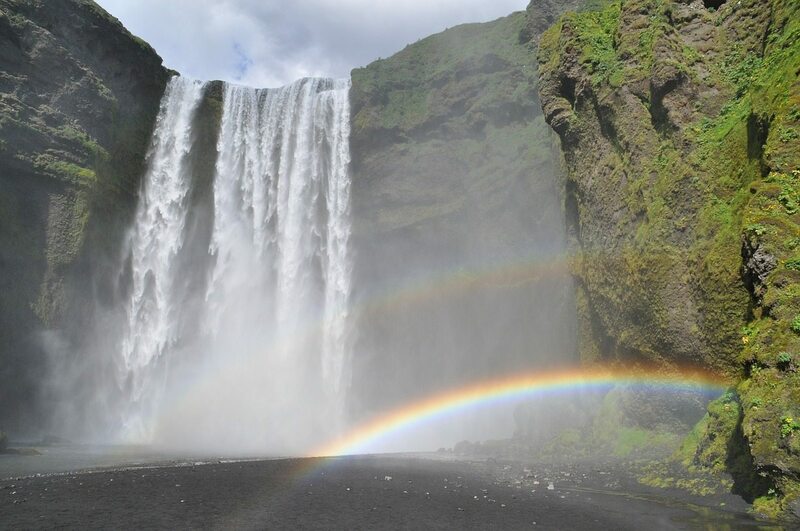 After you managed to take yourself away from the beautiful Skogafoss, you should make your way towards Vik – a city that is famous for its black sand beaches. 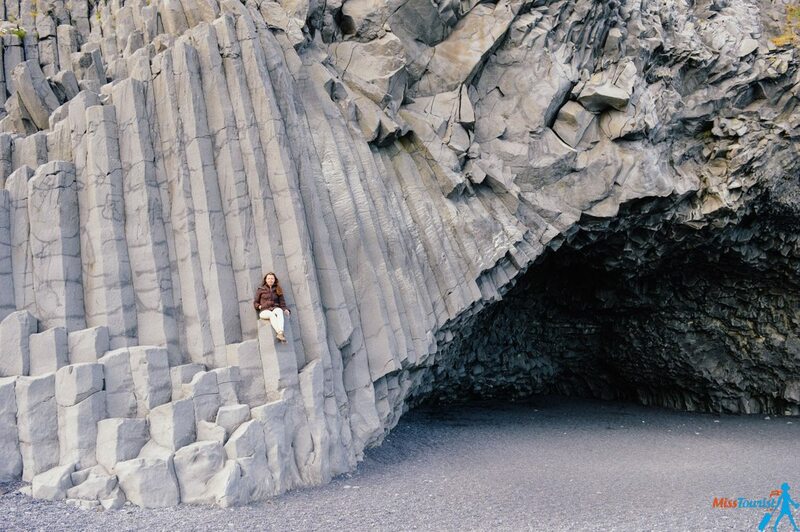 10 km before the town, you will find a sign to Reynishverfi, a black sand beach that you probably heard of before. It is supposed to be one of the most beautiful non tropical beaches of the world, and for good reasons! 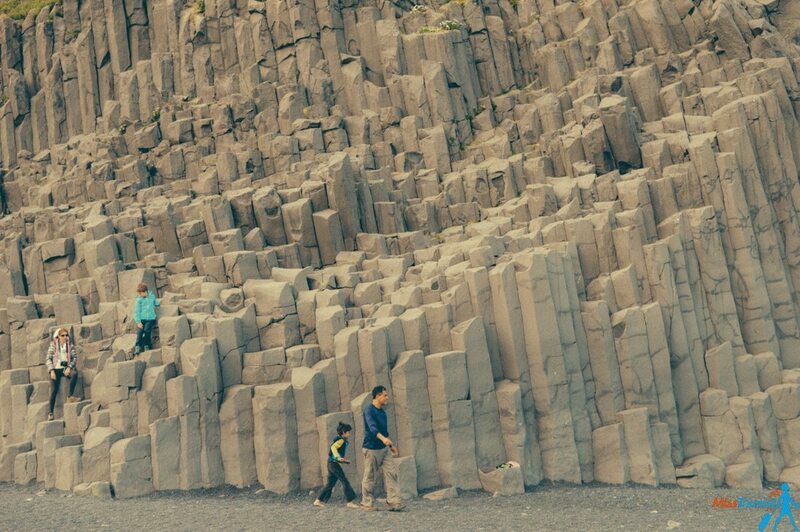 There are some particular rock formations to be seen here: hexagonal basalt columns, created as a result of the cooling of lava after an eruption. I recommend you to find you accommodation anywhere between Vik and Skaftafell. Be aware that there are not so many options in this area, so, if you are going there in high season, book way ahead! I actually had to go back to Hella for one more night as there was nothing available all the way to Eglissadir (something like 5-6h drive). Don’t repeat my mistakes, book in advance (especially if traveling in August, the highest season). If you are packing camping gear, then camping would be the easiest solution in this case, Icelanding camping sites are of very high quality. On day 4 the real fun can start, are you ready? 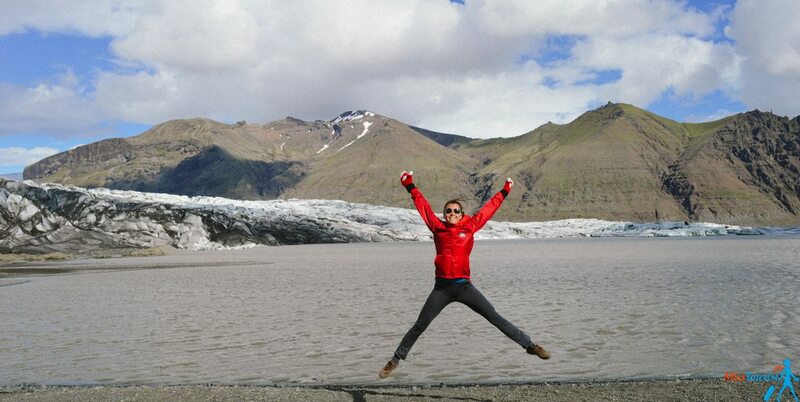 PRO TIP: even if you are visiting the glacier in the summer and it seems warm, get some good clothes for even if you are just talking the walk to see the glacier and not to walk on it. As soon as you get close, the temperature drop and the wind will make you very happy with your choice of warm clothes! 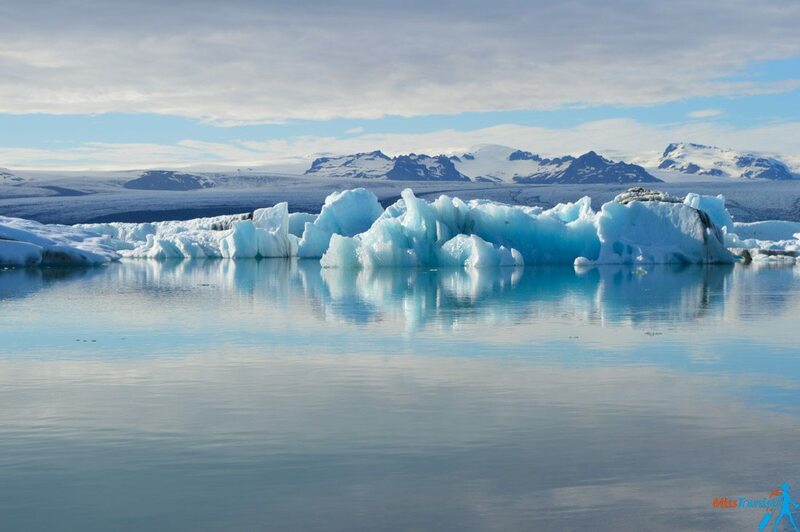 After you had your fun at the glacier, move on to the Jökulsárlón glacier lagoon. 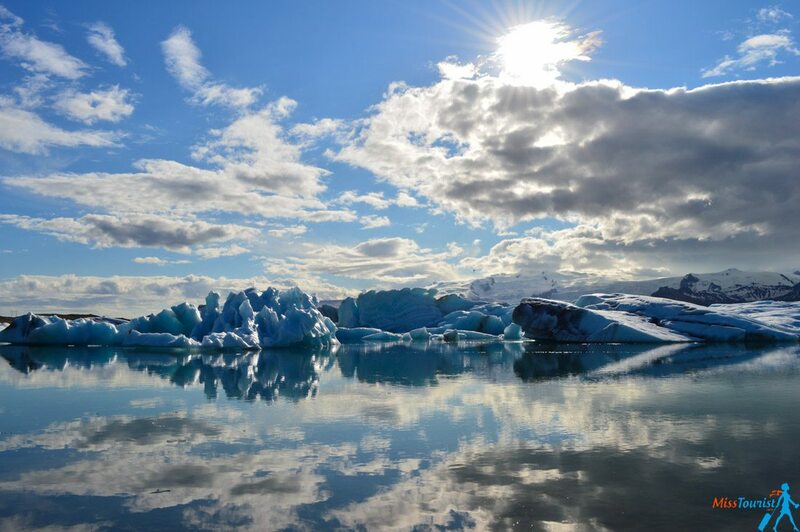 The glacier lagoon is a very new lagoon that takes its water from the nearby glacier. There are many various sized glacier floating in it, each with a different color. For me, this was one of the highlights of the trip! The afternoon sun really turned that place into a wonder. The glacier lagoon was formed only 60 years ago and it is truly beautiful, the floating small icebergs come in many colors and if you are lucky you will see seals swimming and hunting for food! There are two types of boat trips you can take (with the big amphibious vehicle or with a speedboat). I suggest you take one of them, the glacial lagoon is really a unique experience worth paying for! PRICE: around 30 euros for the Amphibious boat, the speedboat is more expensive. You can buy your ticket on the spot, no need to book way in advance. This way, you will avoid booking fees. You can also do the glacier hike and the Jokulsarlon trips together in one by ordering this tour (it is more expensive, but totally worth the money!). If you are having only a 4 day road trip in Iceland, then it’s time to head back to Reykjavik. You have seen so many things in just 4 days. Iceland is full of surprises and I hope you will come back to see the rest! And now, it’s a 4 hour and 30 minutes drive back to Reykjavik so, if you are late, you might consider taking the accommodation somewhere around the return route! For those who are continuing the trip ahead, for accommodation I suggest Hofn area or to drive as long as Egilsstadir. We chose the second option, but I warn you, it is quite a drive! Fuel up as there are also not many gas stations on the way! 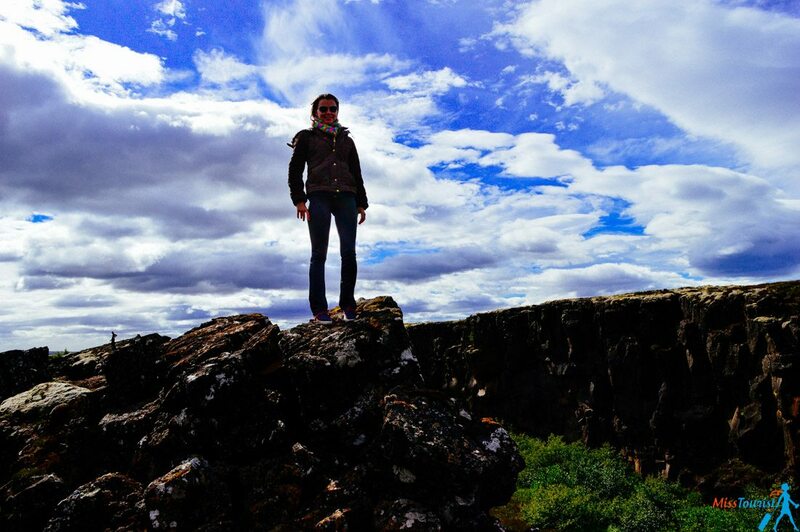 OK, I have shown you some of the best things to do in Iceland. 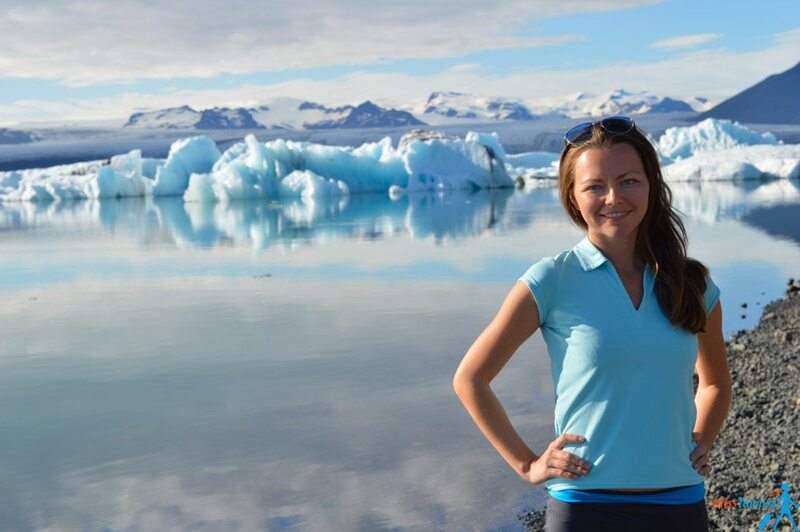 But our road trip through Iceland continues, let me take you to some breathtaking part of this one-of-a-kind country! Next up on the route are the East part and the North part of Iceland. If you want to skip ahead you can read about the Western Fjords click here or click here to read about the end of the itinerary. 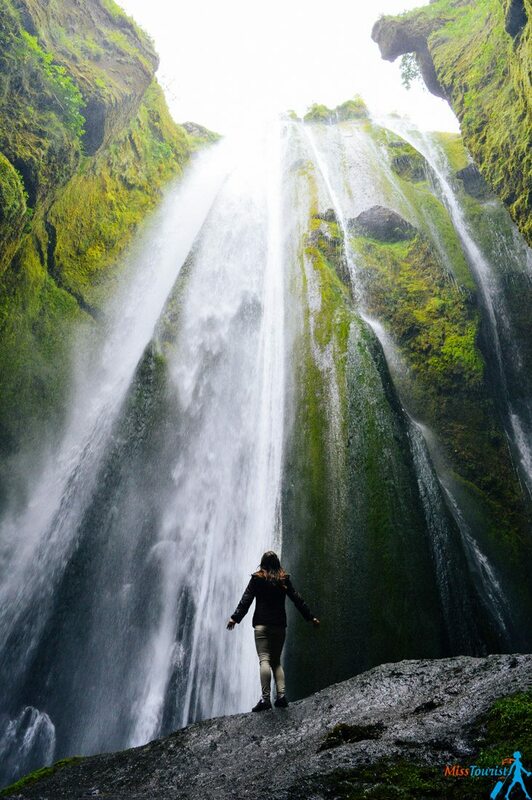 What do you think is a must visit for an Iceland holiday trip? Have you been? I read Extreme by Lark O’Neal (a work of fiction), and the descriptions of Iceland made me want to visit. 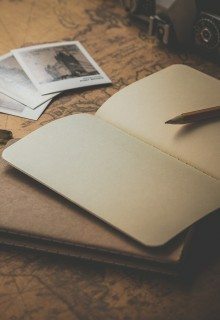 Your blog post seals the deal! I really enjoyed your best of Iceland post, and the photos are spectacular. Hi Celeste! Thank you for the comment! I tried on all browsers and the map works fine. Could you please tell me which browser you used that didn’t display the map, so I can fix it? Hi Yulia! 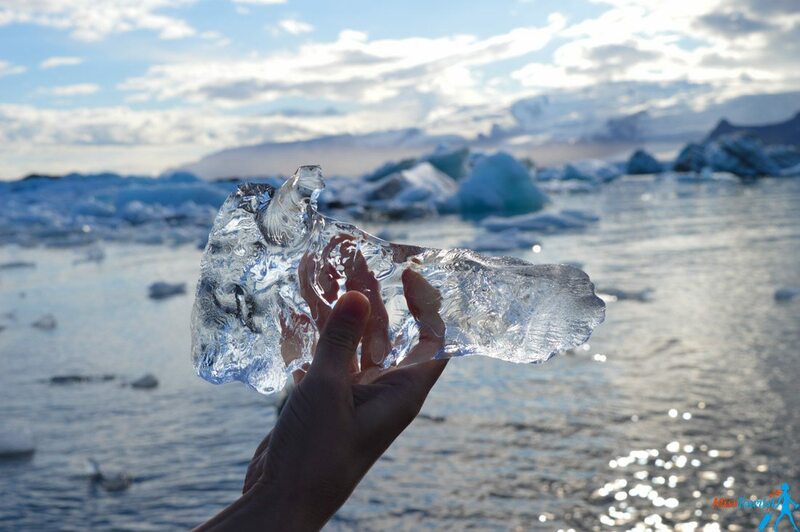 your feedbacks and advices about Iceland are really helpful 🙂 I was wondering if we absolutely need a boat tour to enjoy the Jökulsárlón glacier lagoon or to do the hike the glacier? same question for the Skaftafell glacier. I’m travelling with my boyfriend and we are not really warmed about organized tours. You can see it from the side but it is completely different experience when you are taking a boat. I am also not crazy about organized tours, but these ones are really worth it! 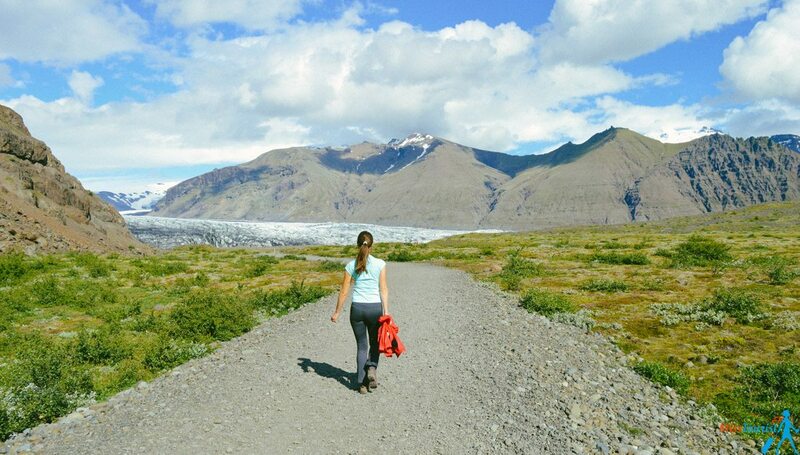 Also, you cannot hike Skaftafell glacier without an orgainized tour. Check some of the options on my side bar to see my recommended tours. Let me know if you have more questions and safe travels to you guys! I had my 4 days trip in Reykjavik during the extreme winter time. It is actually rather dangerous driving one hour 38 min from Reykjavik to Gullfoss and Geysir as the daytime is very short and the road is icy and you can’t see clearly the lines on the road. At one time I thought I am driving to Heaven – just imagine the white cloud and the white snow all mix up in total white surrounding. Moreover not every gas station takes international credit card at those self serve gas pumps (if you are lucky to find one) and what more is one of my tyre got a nail and it’s really difficult to get help in the middle of nowhere. But i think i would go again in the summer time. The unspoiled nature is so tempting. Thank you Milly! I am sure it will be useful for many people here and also for me as I am going to visit Iceland one day again, this time in the winter. Yes, the weather makes it indeed a very different experience from one to another! 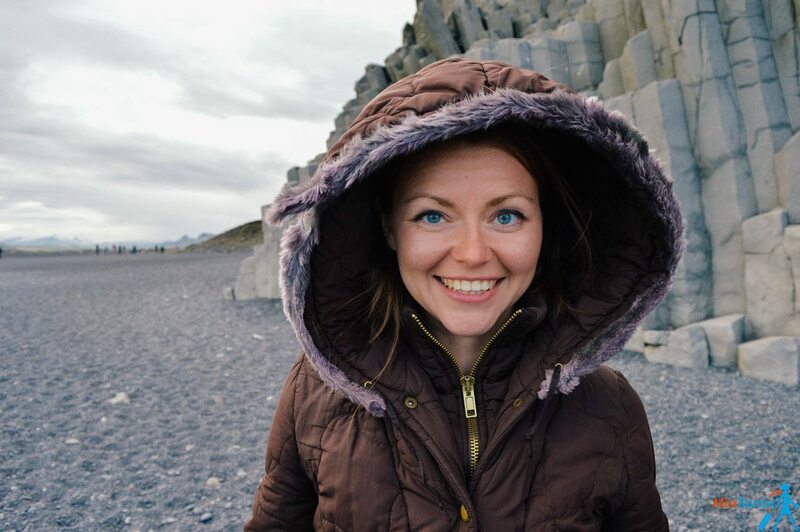 Yulia, when you are there in Reykjavik in winter, make sure you grab the first chance to see the Northern lights as like myself when went there for 4 days and sadly I missed my chance and this is my only purpose to visit Reykjavik in January. The first night, weather was bad, so never mind I told myself, I still have 3 more nights. The 2nd night, guy at concierge of hotel was supposed to be nice telling me as you rent a car, don’t pay for the guided tour, just drive your car follow the tour bus. What a good idea! The lights is up in the sky, no need to pay entrance fee, just look up and everybody sees it. There were charts from the tourist information centre as to which area is best to catch the NL so you can’t key in to your GPS the address as it is different every night. But these drivers they drove so fast in the dark icy roads…. for more than 48 min you still can’t see a trace of the lights. Mind you I needed to drive the same amount of time back to the hotel. What worse, when I tried to fill the petrol at the self serve pumps, they do not take foreign credit cards, that really worries me! Then I thought to myself- not worth the risk, I better pay for the guided tour – I still have 2 more nights. Then sadly, the following 2 nights, the weather was so bad that there were no tour organized for Northern Lights!! I did this exactly as described in Yulia’s blog, from the Golden Circle, to the hotel recommemdation, down to the car rental. Don’t get me wrong, Iceland is an absolutely beautiful destination to visit, but I visited in the winter months from the end of February to the beginning of March, and due to the weather, there are some items that you aren’t able to do. A few pointers…. Skiing gear is preferable, such as waterproof snow pants, ski jacket, sunglasses, warm skiing gloves, and hiking boots. Trust me, sounds ridiculous, but EVERYONE is dressed that way! Everything’s frozen in the winter, so be careful of ice! Thank you SO much Christopher, all the info is super useful! Even if I really want to come back and discover Iceland during the winter, for now I can only give tips on traveling in the summer. Your tips are going to be useful for many travelers, i am certain in that! You are my favorite blogger since you made our Iceland trip easy. You planned it all for us, with bonus tips. I will follow your blog for future trips. I am happy all my work was useful! Thank you so much for providing such a thorough itinerary. Unfortunately, I prematurely booked my stay before doing all my research. I’ll be staying in Reykjavik from 4/16-4/20, would I still be able to visit all the places your recommended from day 1-4 if I drive back to ReykjaviK each day, or does that sound like a very unrealistic plan? At first I was thinking of purchasing tours departing from Reykjavik, but decided to go with the renting a car and wanted to target all the areas you mentioned on your post. Yes, in my opinion it is way more interesting to discover Iceland with a car, i am sure you wont regret your decision. If you can cancel at least the last 2 days of your stay so that you dont have to drive back and forth, i d do that. Also, Skaftafell, for example is more than 300 km away from Reykjavik, are you sure you want to drive this much twice? also, you should consider mileage limits for the car (if there are any) and the cost of gasoline (not cheap in Iceland). Does anyone have any recommendations for places to eat on the third day? Lunchtime food? How much did this 4 day trip cost? This was exactly the sort of info that I was looking for!! We are visiting Iceland next April and I am sure your post will be priceless! Thanks a lot, Yulia! Awesome, Diego! Have an amazing trip! do you have any favorite vendors for a golden circle tour? im headed in october for 3 days. also looking into doing a nighttime northern lights tour or combining with my golden circle tour? 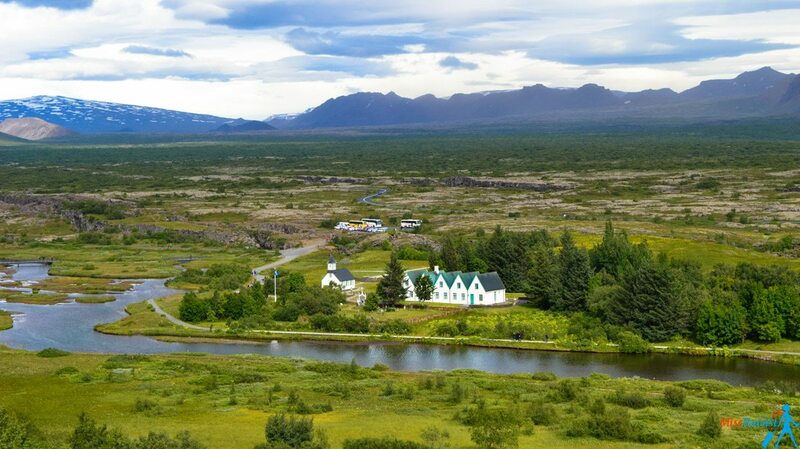 I’d recommend: this 3-days Golden Circle tour where you will see the highlights of the Golden Circle, the Secret Lagoon, whale watching, Jökulsárlón and more! And this 3-hour Northern lights tour from Reykjavik (I recommend going with experts rather than alone because there are higher chances to actually see the lights, not just chase them! ).